Background: The prevalence of overweight and obesity among adolescents has increased dramatically during the past decades, in most developing and developed countries. This study aimed to evaluate the beverage intake among Jordanian adolescents and to investigate the possible associations between beverage consumption and weight status. Methods: A cross-sectional survey was conducted at government and private schools in Amman city, the capital of Jordan. Seven hundred and ninety five adolescent students (400 boys and 395 girls) aged 15-18 years were recruited using a multistage stratified sampling method. Students were asked to complete a validated questionnaire to assess their beverage consumption during school year 2013- 2014. Students' body weight was categorized as non-obese and obese according to the International Obesity Task Force standard. Results: The average beverage consumption was found to be significantly higher in Jordanian adolescent boys than in girls. However, both boys and girls had similar beverage consumption frequencies except for whole milk and sweetened coffee with or without milk or non-dairy coffee creamer. The boys consumed 1-2 cups of whole milk and sweetened coffee with or without milk or non-dairy coffee creamer/day (58.5% and 55.5% respectively), while the girls consumed less than one cup/ day of whole milk and sweetened coffee with or without milk or non-dairy coffee creamer/day (57.7% and 49.9% respectively). No significant associations were established between the investigated beverage consumptions and the weight status for Jordanian adolescents. 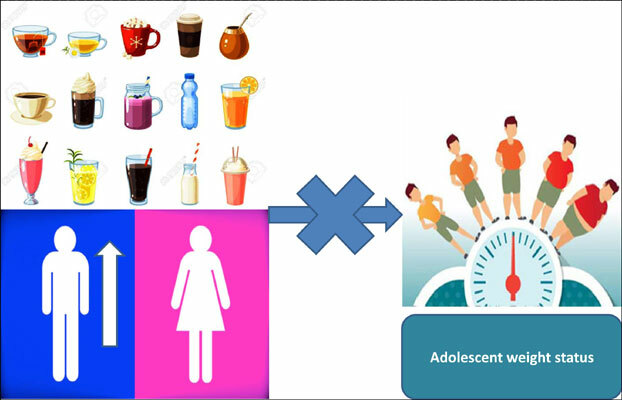 Conclusion: Although beverage consumption was significantly higher in Jordanian adolescent boys than girls, it was not associated with the obesity among Jordanian adolescents. Beverage consumption, body weight, gender, jordanian adolescents, obesity, non-obese.